I lived in the city for all my life except the last two years. Not to give age away, because you know how we women hate to do that, let’s just say it was a LOT of years. Nearly two years ago we sold the city house and moved to the country. A quaint little rural village that we had been visiting every summer for a lot of years. We love it here. Something I wish I had done a long time ago, but then, maybe it wouldn’t be so great for me now. I was never a big outdoors person in the city. I don’t know if it was because it was so noisy or because your neighbours were so close you felt like you were intruding on their time when you were all out in your yards at the same time, but I was not comfortable spending a lot of time in the yard. Sometimes I think it was just the pace of life there. Go, Go, Go seemed the normal. A pressure, almost ingrained from birth, that made you feel compelled to be doing something all the time, away from home. The pace here is different. You can still be do things, lots of things, but you don’t have the pressure to be on the go to do them. Spending time in the yard, on the deck, puttering around are quite sufficient. I no longer feel the need to run to the coffee shop to write. I make a cup at home and head to my office, or on the great days like Sunday, to the patio table on the deck. For months now I have been itching to get out there and sit at the computer to work. I spent many days last spring and summer out there, and quite frankly, I was more productive. It feels like I am miles away but yet I am right there, and can touch the house, be inside in a flash if I have to. I find being outside very inspirational and the time just seems to fly by. Sunday was the first day this spring that all the elements came together. The patio table and chairs were brought up, the umbrella added, coffee made. I jumped at the chance to spend a few hours out there surrounded by the sun, trees, and listening to the birds. Of course my trusty side kick, Ceileigh the dog, joined me laying on her blanket in the sun. I am in heaven again. Here’s hoping the rest of the spring and the summer are warm and sunny and I can spend a lot of days out there. 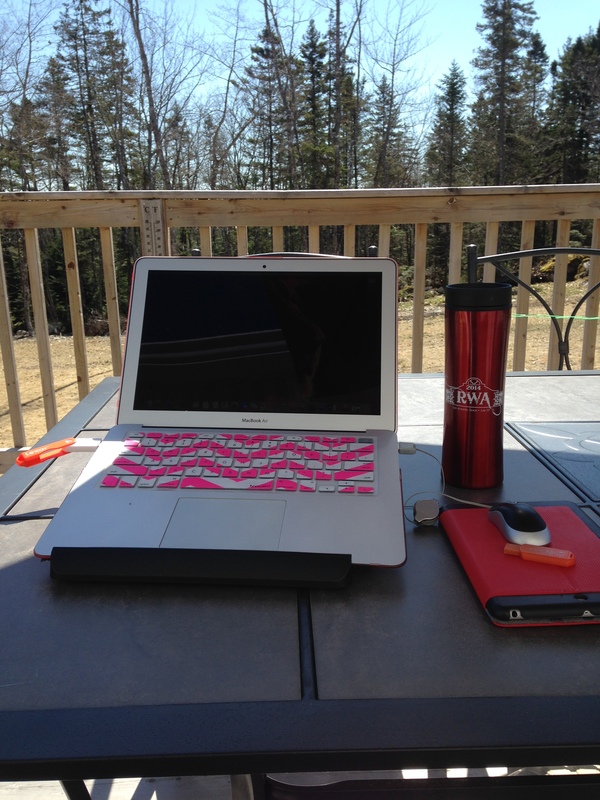 I love writing outside, but unless you’re in shade, it’s impossible to work on a lap top. I find it difficult to read in full sun too; the pages are so bright. Summer feels like it’s closer with the weather that’s coming today and tomorrow. As someone who has been walking in mud for months, the drying-up season is looked forward to.